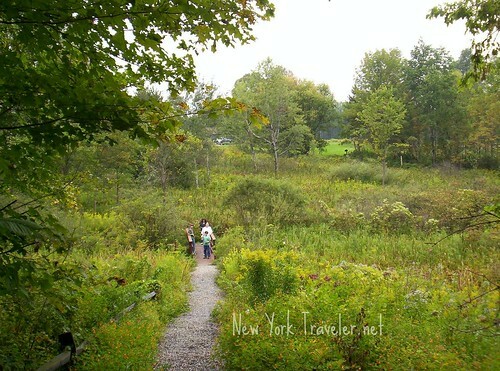 It’s been years since we were out to Little Falls, NY, to see the lovely Nicholas Herkimer Historic site. This was the place where I first caught the travel-history bug: my classmates and I went on a field trip here in 7th grade. It was a spectacular visit. I’ve taken the kids here twice since, but that was probably five years ago now. Gosh, it’s time we paid another visit soon! Nicolas Herchhcimer (now known as Herkimer) was born in 1715, son of German Palatine immigrants who fled to Upstate New York for religious freedom and economic opportunity. (My husband’s ancestors were numbered with this group, as well.) We’d visited one of the stone churches in the area, attended by Nicolas’ parents; you can read that here. 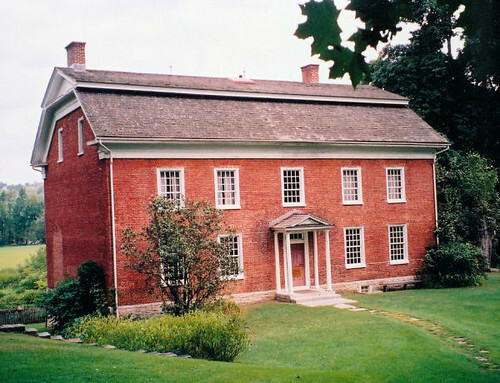 Nicolas built his Georgian-style brick home in 1764, after the French and Indian War. Back then, much of New York State was severe wilderness, and settlers usually clustered their homes near a fort– a barricaded wooden structure where the people could find protection during Indian raids and/or times of war. Herkimer became one of the wealthiest and influential men of the Mohawk Valley, and was in charge of the small militia guarding the fort. When the American Revolution erupted in New York in 1777, he was commissioned to come to the aid of the army at Fort Stanwix in Rome, NY (see our visit here). The Americans there were under attack by a British army in a “three-pronged” attack; this was Plan A in the British effort to cut New York State off from New England and the South. What transpired for Herkimer on that long day of marching his civilian army of Patriots forty miles through deep forests ended in what we now called the Bloodiest Battle of the American Revolution, in Oriskany, NY (see our visit about this here). Herkimer and his army never made it to Fort Stanwix. They were cut down in a surprise attack by Mohawk Indians and American Loyalists. Brothers and cousins were fighting against each other. A monument at Oriskany lists the Patriots and Loyalists, how many of these men were related. Can you imagine– slicing down your brother or your neighbor who had broken bread with you at weddings, who had attended your children’s baptisms? There’s much more detail about the struggles and the battle at my post here, when we visited the sites (which are not far from our own home). The events of the battlefield unfolded the first few days of August 1777. Those summer days were typical Upstate New York days– so hot and humid that the forest literally steamed with heavy gasps of respiration. The American Patriots–led by General Nicolas Herkimer– and their noble allies, the Oneida Indians, were hurrying from Tryon County (Little Falls, NY, area) to Fort Stanwix (in what is now Rome, NY). They were coming to the aid of the fort [there], which was under siege by the British armies [from Canada]. [Herkimer’s army’s] march was a three-day, 40-mile slog through dense woods and swamps. By the time they reached this point in Oriskany, they were only six miles from Fort Stanwix. We could only imagine how laborious this trudge through the depths of the Mohawk Valley had been. Sweet, huh? Back in Oriskany, on their march to Rome, the sweaty, exhausted Patriots stooped down to sip some cool water and wash their sweaty heads. 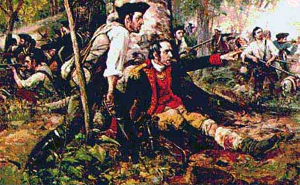 It was at this moment, while the Americans’ backs were turned, that the Loyalists and Mohawk Indian allies attacked them. They had been waiting in the woods for them. In the photo below, the infamous ravine is behind where the kids stand. A small stream still trickles there where Herkimer’s men were ambushed, although it was more densely forested then. Losses were huge. The entire male populations of many towns were decimated. In the end, no one won this battle. 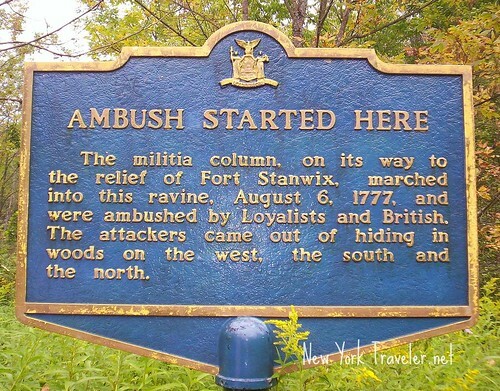 But the Americans considered it a victory, because they had kept the enemy from besieging Fort Stanwix (the army there retreated after hearing about this battle). Nicolas Herkimer was mortally wounded in battle. He was carted home, to die there from injuries sustained in battle and a very bad leg amputation. The Bible he requested before his death is in a large display case at the historic site, open to Psalm 38, his last words. There are tours available through the home– which is very delightful for having such a sad ending to its builder. It’s truly a first-hand experience of life in the mid-18th century. There are many hands-on displays for the kids, including games, tools, and more. I loved the Dutch bed system, which is a cupboard with a bed in it, and a curtain to close the opening (perfect for icy New York winters). We toured the kitchen and barns and root cellar. Every year, there’s a spectacular celebration where life at the Herkimer farm is re-created. This year the event is on Sunday, October 5th. I enjoy your history tours so much. Thank you.. I live in Oregon don’t see myself getting to New York… So you take me there every week. Thank you for sharing!!!! Oooh, I’d love to go there! Great information I love reading about obscure history. Hi Tyler. The Little Falls area is absolutely stunning, I agree! We’ve been through the area several times, including the Herkimer House. We hope to see it again soon. Thanks for your comment!